Nice for a quick-dry broad brimmed hat for those sunny paddle outings. 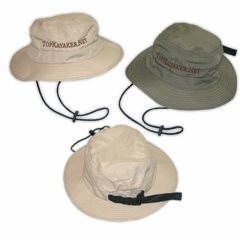 Our basic TopKayaker.Net logo embroidered dark brown on 100% nylon in, Olive or Khaki. Lightweight grosgrain strap for adjustable fit; two sewn-in eyelets on each side; nine-row stitching on brim; nylon cord chin strap with foam slider; mesh sweatband; seam binding.